Crystal Palace beat Southampton 3-0 to end a damaging run of six successive Premier League defeats and ease the pressure on manager Alan Pardew. Two goals from Christian Benteke and another from James Tomkins - players Pardew had spent so much money recruiting - secured three vital points at Selhurst Park. After previously being kept out of the relegation zone only on goal difference, moving to 13th in the table is a step forward. Southampton remain above them in 11th - but were unusually flat while pursuing their third win in a week. It seemed appropriate that in such an important game Pardew placed such faith in his three most expensive summer signings. In the absence of the injured Connor Wickham, he trusted the B#27million Benteke as his lone striker, recalled the B#13million Andros Townsend and selected B#10million Tomkins at right-back. Tomkins' appearance meant Joel Ward starting in what has been the problem left-back position since Pape Souare's career-threatening thigh injury, and Damien Delaney's return to central defence alongside Scott Dann. Southampton's Claude Puel again rotated his team from Wednesday's 2-0 victory at Arsenal, but if Pardew was hoping they would be weakened he would have been disappointed by their high-quality XI. His own team began nervously, conceding possession twice in the opening five minutes and often turning their 4-3-3 formation into a deep-lying 4-5-1. As the first half unfolded, however, they gradually began to frustrate their visitors, whose pace slowed. Regardless, there was little predicting the goal that did so much to lift the tension and inspire such a transformation. Neither side had truly threatened but it was Southampton who had appeared the more likely goalscorers when, in the 33rd minute, Jose Fonte played a routine back-pass to Fraser Forster. Despite both time and space, the goalkeeper inexplicably missed the ball when attempting to clear, gifting possession to Benteke on the striker's 26th birthday, and leaving him to tap in one of the easiest goals of his career. 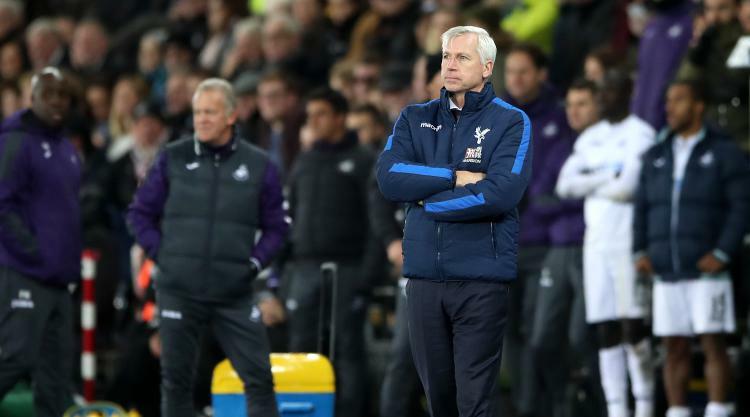 Pardew had spoken of the hours Palace have put into working on set-pieces after their inability to defend them had led to the concession of so many goals, but even the most meticulous work would not have created their second. Only three further minutes had passed when, from a left-wing corner, Jason Puncheon crossed towards Joe Ledley. The midfielder's flick-on then deflected off the unlucky James Ward-Prowse, before rolling across the face of goal and into Tomkins' path - from where he scored with a similarly-easy finish. If any confirmation were needed that Palace's fortunes had turned, it came in first-half stoppage time when despite the ball falling kindly for him in the area, the classy Pierre-Emile Hojbjerg shot wide. There were occasions Palace seemed nervous as they dropped deep in the second half, but as Southampton have on so many occasions this season, they rarely looked like scoring. Oddly, Puel substituted Charlie Austin - his only regular goalscorer this season - and Palace capitalised in the 85th minute when, with Southampton unable to clear possession, Puncheon cut the ball back from the left to Benteke, who tapped in once again from in front of goal.